﻿ Hotel Gabbiano Mola Di Bari. JIMAT di Agoda.com! Ada soalan mengenai Hotel Gabbiano? Dengan lokasi mudah di Mola Di Bari, Hotel Gabbiano adalah tempat yang hebat untuk menjelajahi bandar yang menarik ini. Terletak hanya 0.2 km dari pusat bandar, para tetamu berada di lokasi sesuai untuk menikmati tarikan dan aktiviti di sekitar bandar. Tidak kurang hebat adalah akses mudah hotel untuk ke pelbagai daya tarikan dan mercu tanda bandar, seperti Castello Angioino, Plenilunio Alla Fortezza. Hotel Gabbiano menawarkan perkhidmatan yang sempurna dan semua kemudahan penting untuk menceriakan pelancong. Hotel ini menawarkan pelbagai kemudahan di lokasi untuk memuaskan hati tetamu termasuk yang arif. Hotel Gabbiano mengandungi 48 bilik yang dihias indah dan menawarkan televisyen skrin rata, penyaman udara, pemanas, panggilan kejut, meja. Hotel ini menawarkan kemudahan hebat, termasuk rumah urut, untuk membantu anda berehat selepas hari yang penuh aksi di bandar. Apapun alasan anda untuk melawat Mola Di Bari, Hotel Gabbiano adalah tempat yang sempurna untuk percutian yang menyeronokkan dan menarik. Great experience at the gabbiano hotel...staff were always pleasent always greeting you with a hello or goodbye. The hotel itself was nice as was the location it being right in the center of everything made moving around and exploring an easy thing to do. Great trip overall. My one week stay was a very positive experience. Service was great and staff was very helpful and accomodating to my special requests. The weather in October was beautiful and the room was promptly air conditioned. When I arrived I asked for a suggestion for a good pizza in town, the staff suggested a great pizzeria in the old town not too far from the hotel and provided me with a map. Breakfast at the hotel was also very good. When I left the hotel I forgot a jacket and I returned a few hours later and Anna had already saved it in a bag with a tag and placed it in the lost and found. I enjoyed my stay so much that I am looking forward to my next visit there. di passaggio a Mola per partecipare ad un matrimonio, ho soggiornato presso questo hotel 3 stelle. Hotel molto semplice ma estremamente pulito. Staff molto disponibile: ho avuto accesso alla camera molte ore prima dell'orario previsto per il check in per consentirmi di prepararmi per il matrimonio e il giorno dopo mi hanno servito la colazione nonostante fossi arrivata troppo tardi rispetto all'orario previsto. L'hotel è molto vicino al centro e a breve distanza dalla stazione. Very nice hotel, simple but extremely clean. Staff nice and available to accomodate every customer's requests: I had a very early check in with no extra cost because I had to get ready for a wedding and they served me breakfast despite my late arrival. 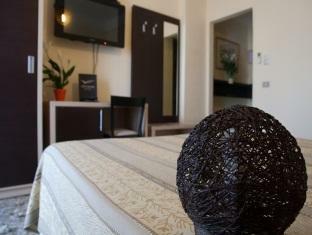 The hotel is very 300 m from the town centre and common beaches and at a short walk distance from the train station. I would recommend this hotel also for the price.